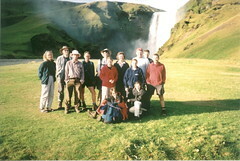 Anna Dora Hermannsdottir (leader) and her son Jökull, Paul Loffler and Linda Dobson, Derek Slater and Stephanie Slater, Claire Vincent, Sarah Naish, Alan Swann, Brandon Hughes, Pete, Anne Watson, Martin. Monday 2nd September - Have a nice lazy day off work. Leave Derby after borrowing Clive's down jacket. Go down the A43, M40 route, no problems with traffic. Pick up the tickets at 8pm, meet Derek and Stephanie, they also booked late. Three hour flight, followed by an hours drive from Keflavic to Reykjavik. The others see the northern lights out of the mini-bus window but I am on the wrong side. Get to the guest house and bed for 1.30am, sleep well. Tuesday 3rd - Have breakfast at 7.30am, ready for pickup at 8am prompt, delayed till 9am. I wear my shorts for some reason. Call in at the Fjallabak office. Meet out guide Anna. Drive for 2 hours across the island. The heavy rain and pep talk from Anna persuade me to buy some Icelandic fisherman style over trousers from 66 north, Paul and Linda buy some as well. Drive further into the hills. Get dropped off just after noon, it is incredibly cold as we step out of the coach. Have dinner shortly afterwards, try the dried fish. Walk over lots of black pumice. Walk towards Hekla, it is covered in snow and mist. It rains off and on all day. Stay in a rather sweet little hut with turf on the roof called Afangagil. Have very good cod and potatoes for tea. Make a start on Paul's duty free rum. We all retire at about 9pm. Wednesday 4th - Have muesli and lumpy milk for breakfast. Leave the hut at 9.30am. Wear shorts again, Anna says that she is impressed, but checks that I have got some proper trousers. It rains from the start. 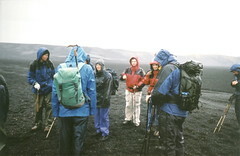 Walk over almost completely black terrain. Explore a rock ravine and then head up a completely black valley. About noon we approach our first river crossing, I manage to jump across it and wait for the others remove their boots and wade, Paul carries Linda over, we all get very cold. Have lunch just after the crossing in almost no shelter. Linda asks Anna if Jökull could pick her up and is quickly told that he is out of radio contact, everyone's ears prick up. Everyone later agrees that this is the low point of the holiday. I feel better after a hot cup of coffee. After lunch we cross a large lava flow from 1910. Anna tells us that it took her 2 hours to cross it the first time since she did not know the way, we do it in about 10 minutes. The rain eases in the afternoon, walk for about 8 hours. Stay in Landmannahellin, a large hut with a fantastic warm shower. We make a start on my Red Label. Thursday 5th - Jökull gives as a talking too about our gear and so I decide to try my dry bags. 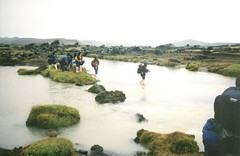 As soon as we set off we have to cross a large cold river, after 1km there is another one. Have dinner in an ice cave. Go over a snowy pass at 1100m. See our first hot springs and bubbling mud, very strong smell of sulphur. Anna tells us that there are large hot springs near to the hut, I spend all afternoon looking forward to a long soak to ease my aching muscles. Arrive at Hrafntinnusker hut at about 6pm, only just bigger that Alport hut. The elevation is 900m. After coffee me and Derek go in search of the hot springs. We almost get swept away crossing the large river, spend ¾ of an hour searching and eventually find a hot spring deep enough to cover my sandals. We have to battle through two large rivers to get back to the hut. Very welcome fish and potatoes for tea. Later we all settle round the main table and Jökull tells us a few stories, in return I keep him fuelled with whiskey. Stay up till gone 10pm ! Friday 6th - During breakfast I have a flash of inspiration and decide to mix drinking chocolate and hot water in with my muesli and lumpy milk, the transformation is incredible. Very good weather, however cold to start with due to the elevation. See a collapsed and eroded caldera from only 300 years ago. 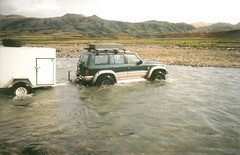 The river is too strong to cross so Jökull ferries us across, Claire acts as his co-driver today, the classical music playing in the vehicle make it very tempting to stay. The "swasi woman" has a lift later on. The weather improves all day. Walk past the bottom of an impressive table mountain called Laufafell. See this many times looking back over the next few days. 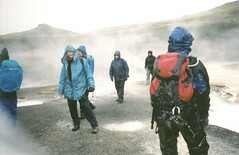 Join the main Laugavegur trail at a haunted hut where Jökull was the warden when he was 17. Arrive at the Hvanngil hut, strange to share the hut with other people. Walk up a small hill nearby to get a great view over the Myrdalsjokull glacier. Jökull has cooked some fantastic lamb chops for tea with blue cheese sauce. Watch the Northern lights till 1am. Saturday 7th - Fantastic weather, back to wearing shorts. Get a lift in the 4WD to cut out a boring part of the walk. Anna tells us that we are going on a small, 2 hour, detour away from the main track. We then take another 1 hour detour to get a close look at Iceland's newest waterfall, see the raging torrent which is the glacier outflow. I develop an interest in different coloured rocks and start collecting lots. Have a nice relaxed lunchtime with more lamb chops. I am ready for a little snooze and a gentle wander to the next hut, however rumours begin to circulate that we have 6 hours of walking to go! 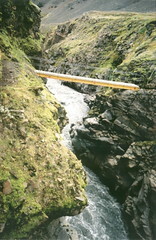 Walk down the valley and cross over a spectacular high bridge. Join the main trail and plod along. We see real grass and eventually see our first tree of the week. Arrive at about 10pm after 11 hours of walking, my right knee has been painful for the last couple of hours. Jökull has brought some red wine for tea which we have with large platefuls of BBQ lamb and hot brown sauce (gravy). Stay up very late till 11pm. Sunday 8th - We have to get up at 6.30am, leave the hut at 8am. Jökull gives us a lift to the bottom of the Fimmvorduhals pass, this goes between the Eyjafjallajokull and Myrdalsjokull glaciers. Two hours walking to get to the top. Me, Sarah and Claire pop ibuprofen all day. Have a fantastic meal on the summit of two whole salmon and a complete leg of lamb. I am not looking forward to the descent, but in the end it is very gentle, We pass many waterfalls, apparently 25, but I soon loss count. A great end to the walk at the Skogafoss waterfall. A two hour drive back to Reykjavik. We are booked into Anna's favourite restaurant for tea, take one look at the prices and decide to go for pizza and beer. The first beer goes down very well. Somehow a few of us manage to drink till 3am, £20 for 4 drinks. I am approached by a girl who used to live on Hartington street in Derby and who wants us to go back to her house for more wine.